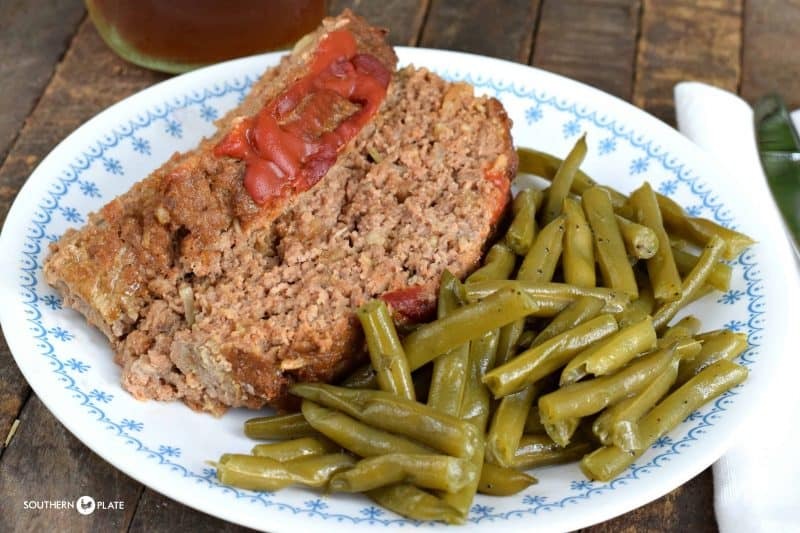 If you’re curious about that meatloaf pictured on the plate, you can get the recipe for To Die For Meatloaf by clicking here. My mother in law (of Linda’s Spaghetti fame) insisted that I post how I made these beans the last time all the Jordan’s got together so I am being a good daughter in law today. It’s just a simple recipe, barely a recipe really because it just uses what you have on hand like our Granny did, but in a world where churning out complicating recipes is becoming more and more popular simple things are often the most appreciated. This is just one of the ways that I make fresh green beans, which are pretty affordable this time of year. In fact, I bought two big bags of them at the grocery store this past weekend and cooked them ahead for supper this week. Hey! Y’all ready to eat? Food ain’t gonna cook itself so let’s get in the kitchen! You’ll need: fresh beans, butter, salt, and pepper. That’s all! If I have some bacon grease handy I like to add a tablespoon or so of that as well, totally optional. You can use frozen green beans in place of fresh if you really can’t get fresh, just promise me you’ll try it with fresh sometime, ok? Let’s not talk about using canned green beans in this recipe, we just don’t even want to let that thought enter into our minds. 🙂 If you want to make canned green beans taste good, check out this recipe (click here). Break the ends off of each bean and then break them into bite sized pieces. Discard the ends or feed ’em to your chickens. Don’t have chickens? Go get at least three or four hens before proceeding to the next step. Place all of these beans in a pot of water along with a stick of butter. Place this over medium high heat and cook until the water cooks down almost completely, stirring from time to time. There will be a little liquid left in the pot but not much at all. This will take anywhere from 30 to 45 minutes or more depending on how hot your pot gets. Don’t be tempted to call the beans done before the water is cooked down. They will be tender before that but not nearly as flavorful as they will be once they are tender all the way through and cooked down to a nice thin buttery coated sauce. These are good with just about anything. We have been eating them as our low carb side when the kids are having rice or mashed potatoes so I like to keep a big container of them already cooked in the fridge for us. Get the recipe for To Die For Meatloaf by clicking here. Break ends of green beans off and discard. Break each bean into bite sized pieces. 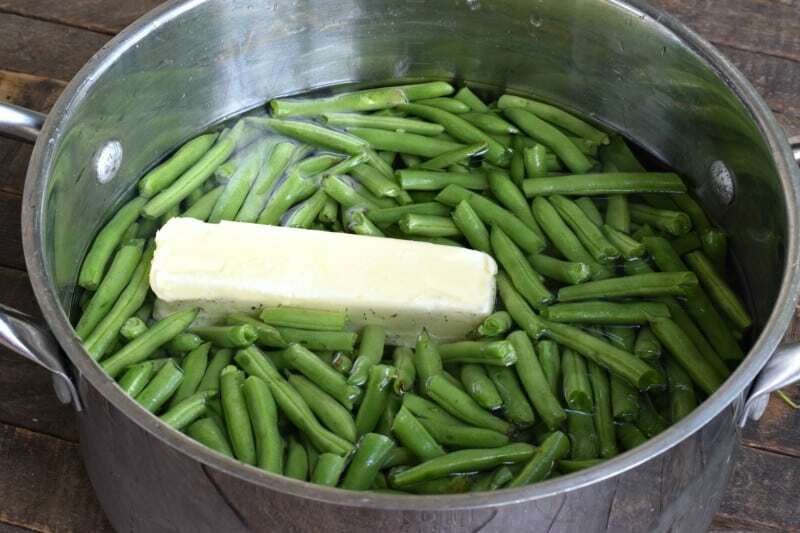 Place green beans and butter in a large pot. Cover with water. Bring to a boil over medium high heat and continue cooking, stirring often, until water is almost completely cooked out and beans are very tender. *A spoonful or two of bacon grease is a great addition if you have it! You weren’t kidding when you said people like to make these big complicated recipes nowadays. Simple is best, in my book. I cook my green beans the same way, and my kids can hardly get enough of them. I appreciate this very much. I have grown my own green beans, successfully, for the first time. This recipe was true perfection. Thanks so much! Oh, and never be embarrassed or afraid to put the “barely a recipe” recipe’s on here. There are plenty of people reading this, that it never occurs to them to make it that way. Be it the first time they’ve ever made it, oor one of those “why haven’t I made this lately?” times. Thank you so much! Please know that you have been a great encouragement to me today!!!!! I agree with Angie H. Christy, remember that there are always brand new cooks – – of all ages – – and cooks who hate cooking but who must do it. Both groups will love these simple recipes. People who enjoy cooking will love them, too, and those who have precious little time will be your fans, too. I am an old cook and I still love the simple way the best! Thanks for sharing Christy! Simple is never a bad thing! I find the most magic in simple recipes, the fewer the ingredients the more dependent on quality of ingredients and execution. Today is Easter. In the middle of making dinner, I had a big pile of fresh string beans. My husband doesn’t care for string beans or at least mine. I really enjoy fresh string beans. I can across your recipe and thought I would give it a try. WOW. He could not get enough of them. It’s simple recipe with a powerful taste. Thank you. PS: No string bean left overs here! Wow, that just made my day!! I am glad they were a hit but am so honored to hear that your husband liked them!! I love simple recipes! This is a recipe I will try! Love fresh green beans! Thanks! I remember when I was growing up my mom and other cooks of the era I knew cooked fresh green beans to death. My mom would put them on in the morning and cook them most of the day. I can’t say they tasted bad as they were seasoned with ham or bacon but I now know that probably nary a vitamin survived. About how many pounds of green beans? Thanks! I guess I’m more old school although I love your faster recipe too. My green beans usually cook about 2 hours or so. With some country ham, a hot pepper, and onion. Add a few new taters to this, a hunk of cornbread slathered in butter, and a big slice of sweet onion and boy is that some kinda good eaten! But I know then it’s no longer low carb. But sure is some good ole country grub! Good ole country grub is right Marsha!! I hate the green beans served out at dinners/restaurants that are so hard when you try to cut them they literally jump off the plate. I read a piece year’s and years ago by James Beard about cooking green beans until they are very tender. He said you could tell when they were done because the cooking odor changed when they achieved that .moment of doneness. My mother said that too and she was just a simple East Texas cook who could make a believer of the most ardent vegetable hater. It works though. Try it. 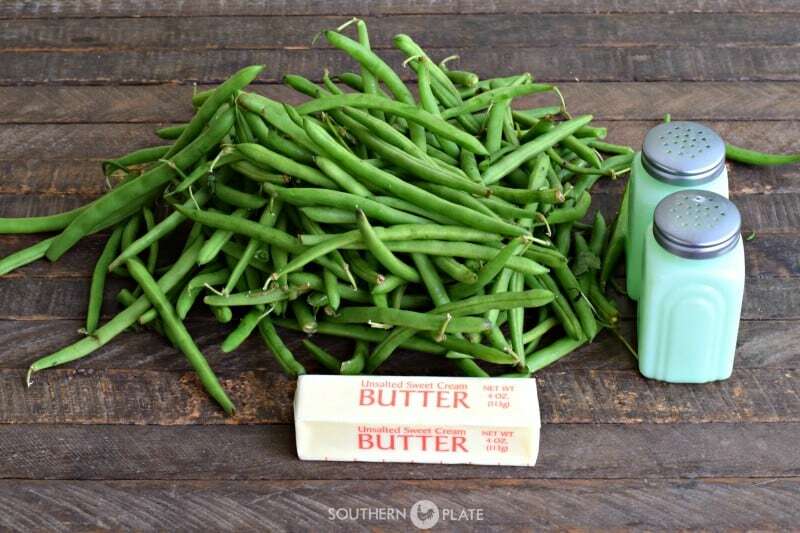 How many pounds of green beans do you use in this recipe? Oh my goodness, I have faith in you Ashley!!! I know you are going to turn out to be a fabulous cook!! Fresh green beans are great, if you have them. I have to respectfully disagree about the canned green beans. A lot of it has to do with the brand you buy. Oh absolutely. That’s purely my personal opinion only and just individual taste. If you like canned ones that’s great! By the way, folks are gonna eventually come across this and wonder what your favorite brand of canned is so feel free to share if you happen back by! Instead of just water, I use a half and half immersion with chicken broth…I think it kicks up the flavor a notch…but I’ve done it both ways and it is imperative that you cook it until the liquid is almost gone! Thank you do much for your simple recipes and your spiritual encouragement! Love, blessings and healing to you Patricia!! I can’t wait to try these. I’ve been making my green beans with ham and onion for years and my family just recently started leaving most of them on their plates. I had no idea there was another way to make them that didn’t taste like they were raw. Maybe they’ll start eating them again if I try it this way. I hope you get the chance to try them soon Kim, I would love to know what your family thinks!! Well when I saw the picture I thought no way! Those are so overcooked they must be mushy & nasty! I like my veggies to have a little fight left in ’em. After I read the comment about James Beard cooking them this way & you swearing by it I’m willing to give it a try. Serious doubts but I’ll let you know. Canned green beans? No way now how! 🙂 I can’t wait till you try them Leslie!!! How well do these freeze? It’s just my husband and me and I’m not a good cook but like to try new, simple recipes and fix extra to freeze for future use. I use chicken broth instead of water to add more flavor. Simple recipes are the best! Neither my daughter nor I like to make these long list ingredient recipes. 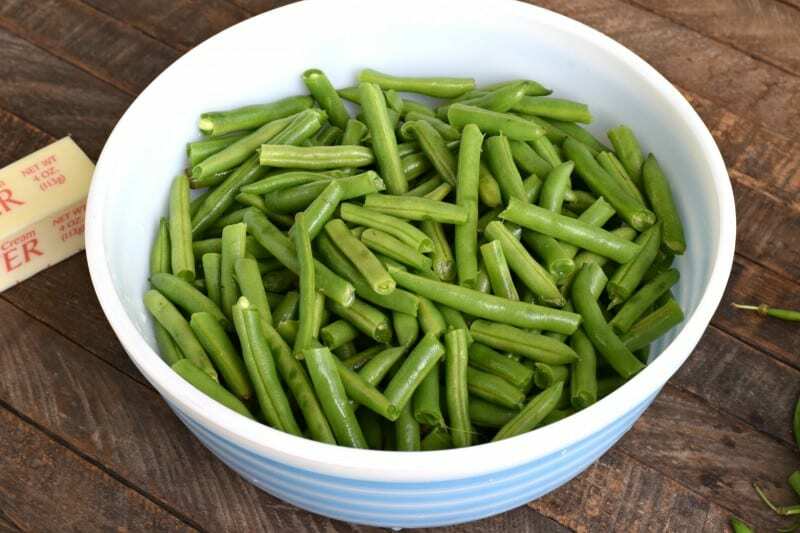 I’d like to see you write a cookbook of super simple and time tested recipes just like this green bean recipe – if you really need a recipe for that. I make mine exactly the same only we like an onion diced up in the pot. It was so refreshing to see this recipe today. Thank you! I agree Gale!! I will have to consider that as a cookbook, I think so many people don’t realize just how simple cooking can be. So amazingly delicious!!! I added some chicken better than bouillon, onion powder, garlic powder, ground mustard! I a man so glad to hear that you liked them Briana!! I love green beans. Turkey Craw Beans, Pink Tip Beans and Greasy Cornfield Beans are my favs for fresh eating. For home canning I like Flat Italian Beans, Kentucky Wonder Beans and Blue Lake Beans. For making Leather Britches I like the Pink Tip Beans. Your simple recipe is perfect for cooking all of them. I love your recipes linked for store bought canned beans. The only way I don’t really like green beans is green bean casserole. Heck, I’ll even open a can of store bought green beans and pour off the liquid and eat them out of the can with a fork. Oh and I love your Three Bean Salad recipe. I have to tell you that I absolutely love this, so easy & taste great! I have been trying to find a very simple way to cook soft tasty green beans and I finally found it. Thank you so much!!! Thank YOU Ann, I appreciate you giving them a try and am so glad to hear you liked them! !